In May 2014 we completed a project to create a 3D/HD home cinema installation in a converted church building in Norfolk. This page is a case study of the project. Technical planning for HD/3D home cinema installation in Norfolk. We were first contacted in early March 2014 to discuss and quote for home cinema installation in Norfolk. 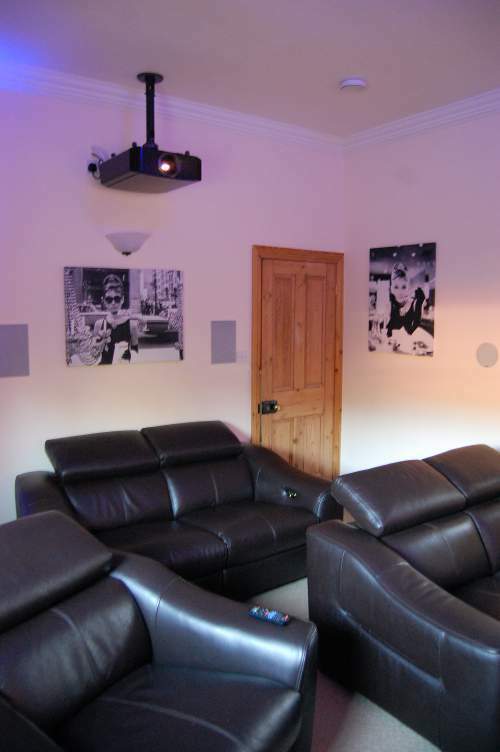 to create a dedicated cinema room based around a JVC DLA-X35 projector. Our prospective client had already done some research and had correctly concluded that this would be a great choice of projector for the dedicated cinema room which he wished to create. As with many of our projects our client is himself a practical person and an enthusiast who wished to keep his costs sensible by doing some of the work himself. The design process for his home cinema installation in Norfolk, didn’t cost the client a penny and continued over several weeks. Many different choices of speakers and AV receivers etc were considered. In the end we provided most of the equipment and specialist installation services. Because we were supplying a large proportion of the equipment, we were able to offer the client a competitive package. Our services included system design, room layout design ,installation and configuration of all technical equipment. The final visual configuration included the JVC DLA-X35 projector in black and a 2.7 Metre (wide) 16:9 motorised screen which equates to approx 120 inch diagonal image size (the audio equipment is detailed in the relevant section below). The HDMI cable (to the projector), was to be embedded inside the walls so it was necessary to have absolute certainty that the cable was up to the job. Therefore an active HDMI cable was used , This has a chip built into the cable to boost the signal strength. This home cinema installation in Norfolk was to be installed inside a former religious building, which has been converted into a family home. The ceiling height was generous so we recommended a projector mount incorporating an extension pole to get the projector more or less level with the top of the image. 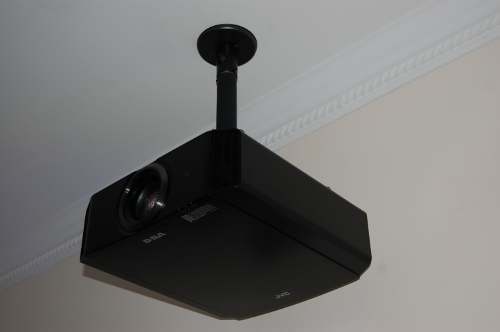 The JVC D-ILA projectors do have a wide range of lens shift available which might have allowed us to mount the projector in a higher position, but our client was keen to have the projector at about this height to minimise all visible cabling. The JVC projectors are substantially built and are a little heavier than most of the competing models from other mainstream manufacturers. We are perhaps a little over the top in our approach to fixing equipment in place , particularly when it comes to suspending projectors above people’s heads. 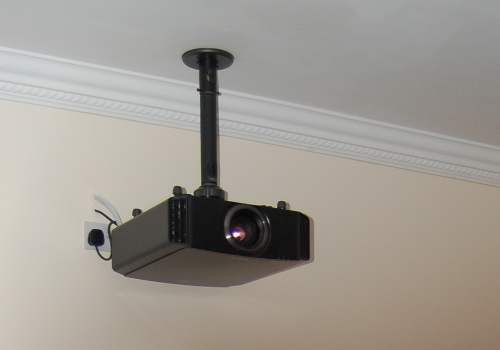 In the case of this home cinema installation in Norfolk we used 100mm M10 coach screws to secure the mount to the centre of a substantial joist. This could probably support ten of the DLA-X35 projectors but it ensures peace of mind. We provided wired ethernet to the projector and also to the Blu-ray player for reception of streaming services as well as to the AV Receiver and the Sky HD box, Games console etc. The cabling for the AV equipment was loomed carefully to achieve maximum neatness and all of the long cable runs were channelled into the walls. 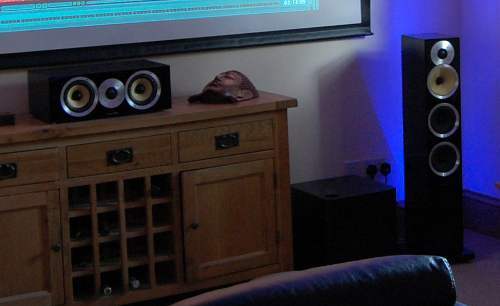 7.1 sound driven from the Integra DTR40.5 in our home cinema installation in Norfolk. For this home cinema installation in Norfolk, our client was keen to dedicate a good proportion of his budget to the speakers. There is little doubt that the speakers are the most critical components of all when it comes to delivering superb sound. Our client opted to use B&W CM8’s and the matching CM Centre speaker with B&W in wall speakers for the surrounds and rear surrounds. These were sourced separately by our client (as we are not a B&W dealer). For the AV receiver our client wanted to go for something which would deliver suitable performance to do justice to the speakers whilst remaining within the budget. We find that Integra receivers (flagship brand from the same company as Onkyo) deliver great audio performance as their components are carefully selected with only the top performing components used in the Integra products. They also have particularly well designed configuration menus and control features which make them ideal for integration with control systems. The current Integra receivers can directly access a great selection of internet music services. The Integra DTR40.5 was chosen as the AV Receiver for the project. We provided the Polk Audio DSW-Pro440 active subwoofer , which was selected to deliver the powerful sub bass. After completion of the Audessy automated EQ procedure the sound was excellent . Hiding away the motorised screen for a subtle but dedicated home cinema installation in Norfolk. 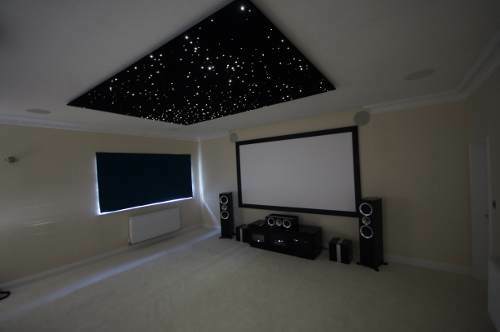 This home cinema installation in Norfolk had to be delivered within a sensible budget. We were able to achieve great results in terms of aesthetics as well as superb performance of the projection screen, whilst remaining within the budget. This was helped by choosing the right screen product. We sourced a screen model which achieves a very flat viewing surface without edge curl, without the additional cost of a tab tensioned screen. This is down to the properties of the screen material. 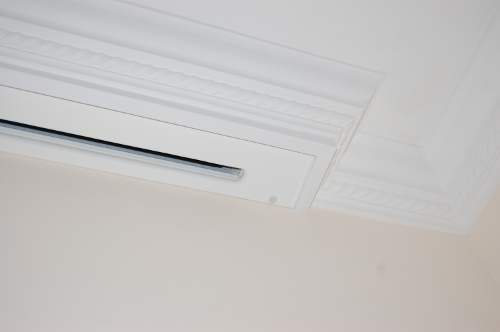 Also the model which we used is not specifically intended for in ceiling use , but it is suitable for that type of use. Choosing a model which is not specifically marketed for in ceiling use can provide a cost effective option. A soffit was constructed and finished off with coving to match the coving in room. This housed the screen case in such a way as to ensure that it appeared to be part of the room rather than just a box fixed to the wall or ceiling. Another alternative for our dedicated home cinema installation in Norfolk, might have been to fit the screen case inside the original ceiling , but in this building, the direction of the ceiling joists prevented this. 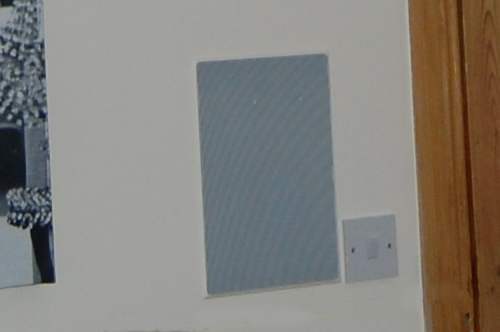 A low voltage trigger cable was installed to bring the signal from the projector’s low voltage trigger output, to the control input on the screen. This ensures that the screen will be automatically lowered whenever the projector is switched on and raised as soon as the projector is shut down. 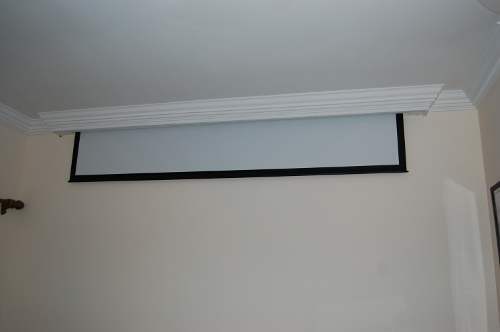 In the case of this home cinema installation in Norfolk, the end stop adjustments of the screen were set up carefully in order to allow the weight bar of the screen to stop in just the right position when retracting or lowering the screen. The finishing touch was provided by colour changing LED lighting, which was used in the room to provide pre and post movie ambience. 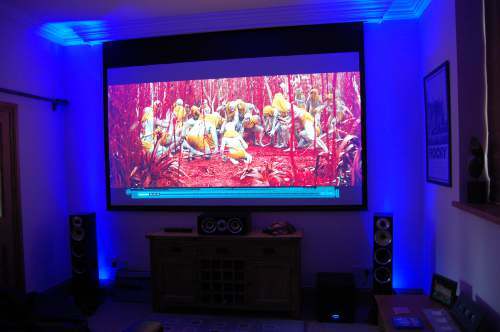 Customer testimonial after completion of his HD/3D home cinema installation in Norfolk. Our client loves his home cinema room which has apparently proved to be very popular with his friends and family (especially during the 2014 world cup): He sent us the feedback below, which he invited us to share with prospective clients. What can I say?….I’ll start with I would be the first to admit that I personally am a demanding customer (my profession dictates attention to detail and this just carries through into everyday life). I want things just right or not at all. Richard (at UK Home Cinemas) patiently and diligently listened to all of my requests, queries, specification requirements, concerns, etc. and always provided a constructive professional opinion and options to choose from, at all stages. In contrast to the other local Specialists (that we had made tentative enquiries prior to locating UK Home Cinemas) we were never once made to feel patronised by our lack of home cinema knowledge or budget constraints. Not everyone wishes to divert the price of a Range Rover on a Home Cinema installation (we didn’t anyway) which seemed a difficult concept for the local suppliers to cope with for some reason. Every conversation left us feeling embarrassed that we had allowed such an apparently inadequate budget! Richard, however, was willing to patiently explain the important bits to us, happy to work within the outline budget given (which he confirmed had adequate scope in reality) and was ultimately able to squeeze an amazing specification for the money invested. We agreed to spend more in some key areas, but we were able to offset this with sensible decisions agreed in other areas (E.G: Screen selection) to balance the budget accordingly. The end result is a system that we love and all of our friends and family have been impressed with. The best bit is that under Richard’s careful direction where compromises were needed they aren’t apparent whatsoever (as we spent where it mattered and saved where it didn’t). The installation overall is excellent value for money in terms of performance vs. financial investment. The key benefit of dealing with UK Home Cinemas is the value of Richards input into the planning and preparation stages of the Project. By getting his input early you do not make expensive hardware and installation mistakes, as he can advise the options to consider, with all of their Pro’s and Con’s so you can make an educated choice. Navigating through the planning stages is how to avoid expensive mistakes later on and as UK Home Cinemas also provided competitive quotations for the supply of everything required along the way, they are a great partner to choose. 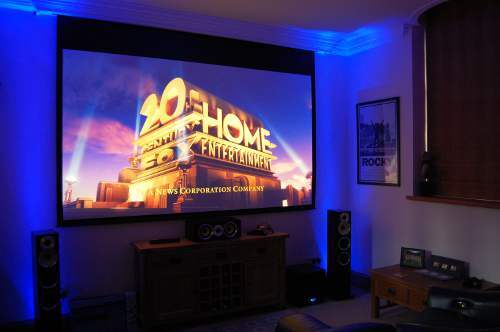 If you want the comfort of a non-pressure, expert consultant (to work with you from Day 1 to achieve the best installation for your outlay) we have no hesitation in recommending UK Home Cinemas…..
At UK Home Cinemas we don’t believe in pressure selling and we will always make sure that our clients get a superb installation for each budget, so why not give us a call?